Parents in New York, Connecticut, and New Jersey will now be able to pick up a new healthy snack for kiddos on-the-go. 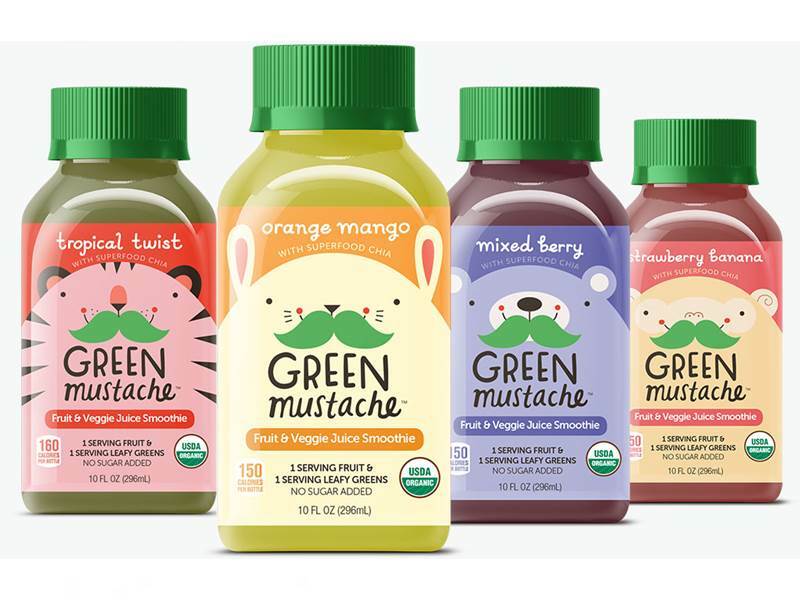 Green Mustache is a new line of organic veggie juice smoothies for children, which recently launched at all five Gourmet Garage locations in NYC. Each tasty Green Mustache smoothie provides one serving of fruits and one serving of vegetables from nutrient-dense leafy greens (fresh spinach and kale). Smoothies are 100% USDA-certified organic, Non-GMO Project Verified, vegan and gluten-free, and some come power packed with goodies like chia and coconut water. These healthy drinks are also free of preservatives, artificial colors and flavors. Gourmet Garage is New York City’s premier specialty food retailer known for offering the finest, freshest and highest quality food items. VanTrang Manges, founder and CEO of Green Mustache notes, “We are thrilled that Green Mustache will be available at Gourmet Garage—they are an ideal retailer for us given their commitment to high quality products. Gourmet Garage is also so well-regarded in the New York City area where many families are on-the-go and looking for ways to help ensure their children maintain a healthy, nutritious diet.” Four delicious kid-tested flavors are available: Strawberry Banana, Orange Mango, Tropical Twist and Mixed Berry. Use the store finder to locate Green Mustache retailers in New York, Connecticut, and New Jersey, or if you can’t find these smoothies, print out the Green Mustache request form and hand it to the manager of your local store. Parents in New York, Connecticut, and New Jersey will now be able to pick up a new healthy snack for kiddos on-the-go.�Green Mustache is a new line of organic veggie juice smoothies for children, which recently launched at all five Gourmet Garage locations in NYC. Each tasty Green Mustache smoothie provides one serving of fruits and one serving of vegetables from nutrient-dense leafy greens (fresh spinach and kale). Smoothies are 100% USDA-certified organic, Non-GMO Project Verified, vegan and gluten-free, and some come power packed with goodies like�chia and coconut water. These healthy drinks are also free of preservatives, artificial colors and flavors.�Gourmet Garage is New York City�s premier specialty food retailer known for offering the finest, freshest and highest quality food items. VanTrang Manges, founder and CEO of Green Mustache notes, "We are thrilled that Green Mustache will be available at Gourmet Garage�they are an ideal retailer for us given their commitment to high quality products. Gourmet Garage is also so well-regarded in the New York City area where many families are on-the-go and looking for ways to help ensure their children maintain a healthy, nutritious diet. "�Four delicious kid-tested flavors are available: Strawberry Banana, Orange Mango, Tropical Twist and Mixed Berry. Use the store finder to locate Green Mustache retailers in New York, Connecticut, and New Jersey, or if you can't find these smoothies, print out the Green Mustache�request form and hand it to the manager of your local store.